Smoking is a problem, for non-smokers, smokers and those trying to quit alike. Many people find the smell of smoke unpleasant, while others are burden by the expense of the habit. However, trying to quit smoking is extremely difficult. Both the physical addition of smoking and the habit of smoking need to be addressed. These days, many people are turning to electronic cigarette options, like Green Smoke, to address the problem of smoking and aid in the process of quitting. However, careful examination of products like Green Smoke is necessary to decide what exactly they really are capable of. 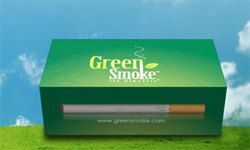 Green Smoke is one of several easily available electronic cigarette options for purchase online. Green Smoke is a two piece system, with an electronic piece and an atomizer included in each filter cartridge. It can be charged via USB or through a wall outlet. Green Smoke contains nicotine but no tobacco, so the manufacturers claim that Green Smoke does not contain all of the harmful chemicals usually found in a cigarette. They also claim that Green Smoke is much better for the environment as well. How does Green Smoke work? The Green Smoke electronic cigarette comes in two pieces. The long, white piece is the battery, while replacement filters, which contain the nicotine, attach to the end. There is an atomizer in each filter, vaporizing the nicotine. This allows for the inhalation of nicotine without any actual smoke, but water vapor instead. Green Smoke is also marketed as a "social cigarette." Since there is no actual smoke associated with the Green Smoke electronic cigarette, non-smokers are not bothered by the problem of second hand smoke when spending time with a Green Smoke user. At the most basic level, Green Smoke is a cigarette replacement that many people believe will break them of the habit of smoking all together. The Green Smoke electronic cigarette is available for purchase online. Those who are interested in Green Smoke should first understand that while starter kits are available, the Green Cigarette filter cartridges are not permanent and will need to be continually purchased and replaced. Batteries, chargers and other accessories may be purchased separately as well. The Green Smoke starter kit is available for $140 plus shipping and handling, so it is certainly not an inexpensive option. The Green Smoke starter kit contains one long battery and one short battery, as well as one USB charger and five cartridges. Replacement batteries for Green Smoke cost $40 while additionally cartridges are sold in packs of five for $15 plus shipping and handling. Is Green Smoke effective to stop smoking? Those looking to break their addiction to nicotine should realize that Green Smoke does contain a significant amount of nicotine. The only difference that the Green Smoke electronic cigarette makes is the hassle involved with keeping track of all of the small pieces, making sure that nothing gets broken and continually charging the batteries of the electronic cigarette. Those using an electronic cigarette like Green Smoke to try to quit smoking are not breaking any of the habits that comprise their addition. The cost associated with purchasing the Green Smoke system, the replacement cartridges and how easy it is to lose or break the small electronic pieces that comprise Green Smoke make the product nothing more than an expensive habit replacing another expensive habit.